The 5th Steering Committee and 2nd Training Course of CO-EVOLVE were organised in Barcelona by the CPMR Intermediterranean Commission (IMC) two years after the project began. Key internal issues were discussed during the project’s Steering Committee, in particular the progress of pilot actions in the project’s 7 pilot areas that are still in the process of estab lishing a dialogue with key local stakeholders so as to develop strategic plans adapted to their characteristics and needs, and in line with the ICZM and MSP principles. The upcoming transferring phase of the project, due to begin in May 2019, that aims to adapt the methodology of the project so that it can be replicated in Mediterranean territories beyond the project’s partnership, was also discussed. The 2nd Training Course, one of the project’s testing activities, was organised on this occasion to assist partners in the implementation of pilot actions. It focused on “planning for improving the coastal and marine sustainability of tourist areas” and included theoretical sessions on ICZM plans elaboration, the “Climagine” participatory method used for coastal plans, the practical use of indicators on the pilot project areas, financial opportunities and economic instruments for pilot project implementation, as well as a more practical course (e-learning) on designing and managing participation processes. It was open to CO-EVOLVE observers and MedCoast4BG partners, some of which foresee the application of the project’s methodology in other pilot areas in their territories. The last day was dedicated to a joint meeting of CO-EVOLVE and MedCoast4BG projects with the aim to present the objective and overall structure of MedCoast4BG and explore joint actions and funding opportunities with delegates from Mediterranean partner countries i.e. Morocco, Tunisia, Lebanon, and Montenegro. 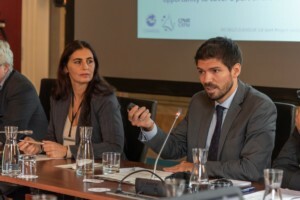 The UfM-labelled MedCoast4BG (Med Coasts for Blue Growth) project, which is promoted by the CPMR IMC and gathers all CO-EVOLVE partners, intends to extend the conceptual and methodological model of CO-EVOLVE and its demonstration pilots to Southern & Eastern Mediterranean countries, while promoting the matchmaking of several connected actions and funding at Mediterranean level. It was labelled by the 43 countries of the Union for the Mediterranean (UfM) on the occasion of the Senior Officials Meeting held on 11 December 2017. MedCoast4BG responds directly to the priorities of the UfM and more specifically to priorities identified in the 2014 UfM Ministerial Declaration on Environment and Climate Change and in the 2015 UfM Ministerial Declaration on Blue Economy. The joint meeting was the occasion for partners of the MedCoast4BG together with representatives from the UfM Secretariat to exchange on the project’s characteristics and advancement and explore further funding opportunities and synergies with other relevant initiatives i.e. MUSES project, BLUEMED Coordination and Support Action (BLUEMED CSA), the Bologna Charter, West MED and PANORAMED. In addition to this, potential new pilot areas located in Mediterranean Partner Countries and Montenegro were presented by delegates -members of MedCoast4BG- that were invited for the occasion. In this framework, partners also discussed about a connected project proposal (Co-Evolve4BG), which was submitted under the ENI CBC MED first call for proposals and is currently under evaluation. 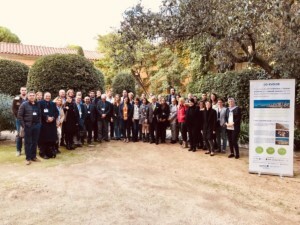 The proposal is led by the Tunisia National Institute of Marine Sciences and Technologies (INSTM) and is involving several Mediterranean Regions, Universities and Foundations, as well as institutional and non-governmental partners from Lebanon. This project is completely in line with MedCoast4BG, which, in case of approval, will be supporting directly its implementation. It is finally to note that delegates of the MITOMED+ project were invited to participate in the two last days (Training Course and joint meeting). CO-EVOLVE and MITOMED+ took this opportunity to sign a Memorandum of Understanding to seal their collaboration and foresee joint actions. For more information, please contact Davide Strangis (davide.strangis@crpm.org), Emmanuel Maniscalco (emmanuel.maniscalco@crpm.org) or Flora Leroy (flora.leroy@crpm.org).